This is the first of a few posts based on my morning today at Glencairn primary helping with their ipod touch project. I started syncing and adding a few apps to the iPods. When I had originally set up the ipods with apps it took an age, syncing them two by two to my macbook and I was not looking forward to repeating the exercise. In the meantimne I’ve become a middle man between the Consolarium and a north Lanarkshire school to trial Taptale, this involves LTS lending the school sone ipod touches and a parasync. While we are waiting to get that project up and running I borrowed the parasync to update the Glencairn iPods. 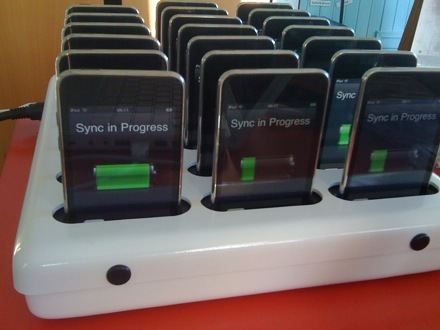 It took about 20 minutes to sync all of the iPods. The only glitch was the fact that I had turned of installing apps in the iPods restrictions. Once I had reset them all the update went flawlessly. A parasync costs about £800 which is probably outside most school budgets in current times, but when weighed agains the time that it takes to sync 20 ipods two by two it is to my mind worth considering. It might be worth several schools owning one together using it for major updates and just recharging the ipods with 4-Port USB Chargers. I was delighted to see that most of the children had personalised their ‘screensavers’ with drawings, photos and even lunes! More about the apps I’ve added to the touches soon.